Crestron Flex is a comprehensive line of integrated communications and collaboration solutions. Current options include conferencing and desk phone solutions for Microsoft Teams and Skype for Business, with future solutions coming soon for Zoom Rooms and Open UC (open-platform support for any web collaboration, conferencing or telephony platform). From the desktop to the conference room and beyond, Crestron Flex delivers a uniquely simple and consistent user experience in all the places people work and meet. Built on the IoT cloud based XiO Cloud platform, Crestron Flex empowers IT administrators and AV integrator’s to deploy, manage, monitor, and evolve thousands of networked UC devices – simply, quickly, and securely – all from a single dashboard. By standardising on Crestron Flex, any organisation can realise a more productive and stress-free workplace through greater acceptance and utilisation of UC technology that is truly easy to use. Crestron Flex transforms any meeting room, huddle space, or executive office into a highly effective collaboration space, enabling people to work together and share content irrespective of location. Intuitive operation, exceptional full-duplex wide-band audio, and full-motion HD video afford a gratifying and productive meeting experience for all participants. Crestron Flex is secure, easy to deploy, and easy to manage, with extensive features and capabilities engineered to maximise the value of your investment through increased efficiency and productivity. Microsoft Teams is the hub for teamwork in Office 365 software, engaging people and bringing them together through messaging, voice over IP, online meetings, conferencing, content sharing and collaboration. The Flex system brings the full Microsoft Teams IC experience to any meeting space, whether implementing a cloud-based Microsoft Teams deployment, on-premises Skype for Business or a hybrid of the two. Want Crestron Flex Video Conferencing for your business? Phone us now on 07 849 0901. XiO Cloud is Crestron’s unifying IoT cloud-based platform for remotely provisioning, monitoring, and managing Crestron devices across an enterprise customer or an entire client base. XiO Cloud enables installers and IT managers to deploy and manage thousands of devices in the amount of time it would ordinarily take to manage just one. It provides a zero-touch solution that allows complete configuration of device settings without any hardware in hand, then simply connect each device on site and let XiO Cloud push out the settings, licenses, drivers, and firmware updates – automatically and securely – for a quick and painless, ready-to-use deployment. 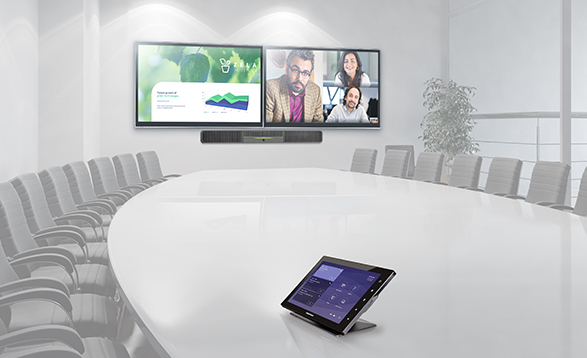 The Crestron Flex B160-T system provides a complete video conference room solution for use with the Microsoft Teams intelligent communications platform. It supports single or dual video displays, and features the Crestron UC Video Conference Smart Sound Bar and Camera, which comprises a high-performance, full-duplex conferencing speaker phone and camera in one stunning wall mountable device. Control of the complete system is provided via s high-definition 10” table top touch screen. An all-in-one front of room device, the Flex B160-T system facilitates effortless conferencing without any other microphones, speakers, or camera to install. Mounted on the wall or placed on a credenza beneath the display(s), the smart sound bar looks great and sounds even better. Its high-powered stereo speakers, adaptive beam-forming microphone, and advanced digital signal processing deliver exceptional full-duplex speakerphone performance with highly intelligible, echo-free voice clarity. Its compact all-in-one design reduces clutter on the conference table, and even accommodates rooms with no table at all. A perfect view of the room is achieved through the built-in, high-end conferencing cameras, which features HD 1080p video resolution and ultra wide-angle 150° diagonal field of view. High precision aspherical optics, 12MP CMOS sensor, and advanced video processing ensure an immersive, crystal clear video image free from light or noise artifacts or optical aberrations. Genius Framing digital auto-zoom intelligently detectors all the people in the room and frames everyone in the shot so no one gets left out. The smart sound bar features an alluring multicoloured LED status bar, which stylishly displays the volume setting in an outwardly expanding bar of light, and changes colour to indicate operations and mute status. Installation is a breeze using the integral hinged mounting bracket, which attached easily to the wall and allows the sound bar to be tipped forward for full access to the rear panel connections. Whether starting or joining an online meeting, dialing or answering a phone call or video call, looking up contacts, or presenting and sharing content, the Flex B160-T system is incredibly easy and intuiting to use. Simple operation and one-touch meeting joins are facilitated through a customisable, feature-rich touch screen UX familiar to users of Microsoft Teams and Office 365 software. Its native Teams UI means staff members can move effortlessly between using Crestron Flex in the meeting room and a phone or personal computer at their desk or workstation. Built-in calendaring and corporate directory access provide users with the tools they need to work smartly and efficiently. The Flex B160-T system ships with one 10” table-top touch screen included. A second touch screen may be added to provide a second point of control. Additionally, Flex B160-T allows the ability to integrate with a Crestron control system ton enable touch screen control over room lighting, motorised window shades, climate control, AV and other amenities. The touch screen can sit freely on any table-top, shelf, or credenza, or be permanently attached to the surface using the option 330° swivel mount kit. It can be powered using PoE from the network or the included 100-240V PoE injector. All the capabilities of a complete Microsoft Teams video conferencing and content sharing solution are empowered by the Crestron UC Engine. For ultimate performance, Crestron employs a powerful Intel NUC Mini PC running Microsoft software with built-in XiO Cloud provisioning. The UC Engine forms the core of the Flex B160-T system, providing extreme processing performance, Gigabit Ethernet, and complete connectivity for one or two HD displays and the smart sound bar. Presenting and sharing content from a laptop PC is facilitated through a single HDMI input, supporting full-motion HD video and audio via the included HDMI to USB converter. The converter and UC Engine are mounted together on a bracket, which comes fully pre-assembled and ready to install behind the display device(s). All required cables are included for a complete and simple installation. Just add your choice of HD displays, display mounts, two LAN connections, and AC power. The Crestron Flex system facilitates perfectly natural conversations with exceptional audio fidelity and pickup. The sound bar’s integrated 180° far-field microphone array faithfully captures voices throughout the room using adaptive beam-forming technology to focus in on whoever is speaking. Its high-powered, two-way stereo speakers produce full, rich, and real sounding audio for both voice and program material. High-performance AEC technology achieves transparent full-duplex performance free of distracting echo or noise. Wide-band audio codex support allows for full-spectrum, bi-directional voice communication. Crestron Flex is an enterprise-grade solution, engineered in partnership with Microsoft to integrate seamlessly into any Microsoft Teams or Skype for Business deployment. Crestron Flex is ideally equipped for mass deployment throughout any sized corporate, university, medical, military, or governmental facility. IoT cloud-based provisioning enables complete network configuration in advance of hardware delivery, with touch-less updates following installation. Crestron Fusion or XiO Cloud management enables monitoring and logging of rooms and equipment usage, as well and centralised help desk support. Advance security features ensure privacy, reliability, and compliance with the organisation’s IT policies. The ultimate front-of-room video conferencing solution for Microsoft Teams. Present, call, conference, and collaborate – all through a single smart sound bar and 10” table-top touch screen! Native Microsoft Teams touch screen UX – provides a consistent user experience with simple operation and one-touch meeting joins. A complete kit solution – just add displays and mounts. Works natively with any Microsoft Teams or Skype for Business accounts – no MCUs, gateways, or other add-ons needed! Connects and communicates securely over any enterprise or SMB network. Supports single or dual display configurations. Integrated high-definition USB camera with lossless digital auto-zoom. HDMI input for laptop and other AV content sources. Dual HDMI outputs for room display devices. Extremely natural 2-way wide-band voice quality. Integrated 180° far-field adaptive beam-forming microphone array. Advanced AEC & DSP technology. Stylish multicolored indication of volume, mute, and operational status. Analog audio input and output for local source and assistive listening devices. 10” (257mm) table-top colour touch screen. Support for a second touch screen. Active Directory authentication and corporate directory access. Microsoft Exchange and Office 365 integration. Onscreen calendaring and meeting management. Optional control of room lighting, shades, thermostats, and other equipment. IoT cloud-based provisioning and management. Optional 330° touch screen swivel mount available. For all your video conferencing solutions in Hamilton and the wider Waikato, please contact us to discuss your requirements with our expert staff.